Part of the charm of woodland in the Châtaigneraie, where I live, is that it is not properly husbanded – pace believers in strict political correctness – partly because much of it lies on very steep slopes. As a result, one finds a very wide range of tree varieties: sweet chestnut, horse chestnut, false acacia, oak, ash, elm, beech, silver birch, lime, medlar, white poplar, lombardy poplar, aspen, spruce pine, wild pear, crab apple, spindle tree and wild cherry, among others. Each individual tree has to fight it out with its competitors in the ecosystem. The result is a pleasing variety. In autumn, the deciduous trees’ leaves turn many different hues of brown, yellow and russet as the days get shorter, sometimes producing an almost chocolate-box effect that has people rushing for their cameras – almost always with disappointing results. In spring, before any leaves come out, banks of woodland seen from a distance are dotted with what seem to be sparkler-like explosions of tiny white specks: these are wild cherry trees coming into bloom. Later they will bear very small dark cherries that burst gratifyingly in the mouth (and less gratifyingly on one’s clothes if one is not too careful). As with the wild strawberry, the wild cherry’s flavour is ‘gamier’, more intense and more astringent than its cultivated version. The only problem is that the fruit is often inaccessible, since wild cherry trees grow to a respectable height (up to 30m). One can get round that by picking cherries from trees on a steep incline, where there are branches that can be reached from a higher stretch of hillside. One of the best uses for wild cherries is a kind of baked cherry custard called clafoutis. There are many versions of this farmhouse favourite. Those dating from hungrier days call for a high proportion of flour to egg, and tend to result in stodge. The recipe given here is an ‘improved’ version devised by my old friend, Win Campbell (who made the Chez Gram sampler illustrated on the home page). It calls for more eggs and slightly less sugar than most recipes. Butter a shallow baking dish large enough to hold the cherries in a single layer. Sprinkle with 30g (1 oz) of flour and shake vigorously so it spreads evenly over the surface. Tap out excess flour. Wash, stem and pat dry the cherries with kitchen tissue. Spread them in the baking dish. Put the rest of the flour into a mixing bowl and stir in the sugar, then the eggs. Mix thoroughly. Warm the cream and gradually add to the mixture, stirring all the time until a smooth batter is obtained. Pour evenly over the cherries. Bake for 45 minutes in a fairly hot oven (190°C/375°F/Gas mark 5), or until well browned and slightly puffed up. Remove from the oven, sprinkle with icing sugar if desired, and leave to cool slightly. The clafoutis, which will subside slightly, should be served warm but not hot. It is also good cold. 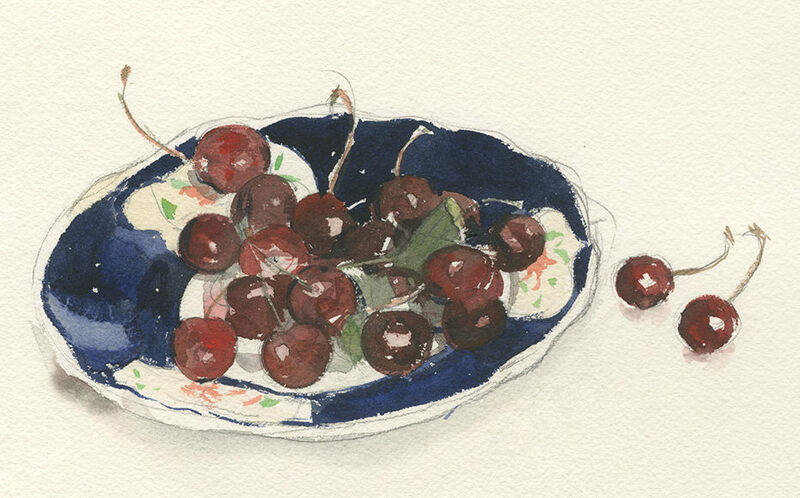 You should warn your guests that the cherries have not been pitted, otherwise their teeth may get a nasty shock – or worse. The reason the cherries are left whole in this dish is that their pits, as they heat up, contribute a characteristic hint of bitter almond. They also retain all their juice. As for the word clafoutis, it would seem to have an interesting etymology. In modern French, it features in the dialects of the Limoges and Poitiers areas and is first recorded in 1864. The word derives from the mediaeval French claufir, ‘to fasten with nails’ (clavo figere), found in the Passion de Clermont, an anonymous poem dating from around 1000, describing the nailing of Jesus Christ to the cross (stanza 57, published by D’Arco Silvio Avalle, Milan, 1962). Claufir subsequently came to mean ‘to distribute’ or ‘to stud’, a reference to the ‘studding’ of cherries in a clafoutis. Another important issue for purists is the type of cherry used in a clafoutis. I have indicated wild cherries (or Morello cherries if unavailable). The celebrated ‘Prince of Gastronomes’, Curnonsky (1872 - 1956), was a stickler for such matters: clafoutis had to be made with small black cherries from the Limousin area (in other words, wild cherries). As Curnonsky put it: ‘A true clafoutis calls for the tasty little black cherries that are found only in the Limousin [not strictly true]. To achieve a perfect clafoutis, you have to have Limousin blood in your arteries – beautiful dark blood like the blood of Limousin cherries.’ Curnonsky was in fact born Maurice Edmond Sailland in Anjou, not the Limousin. A spectacularly corpulent man, he acquired his fashionably Slav-sounding nom de plume (from the Latin cur non? – why not?) at the suggestion of his humorist friend Alphonse Allais.